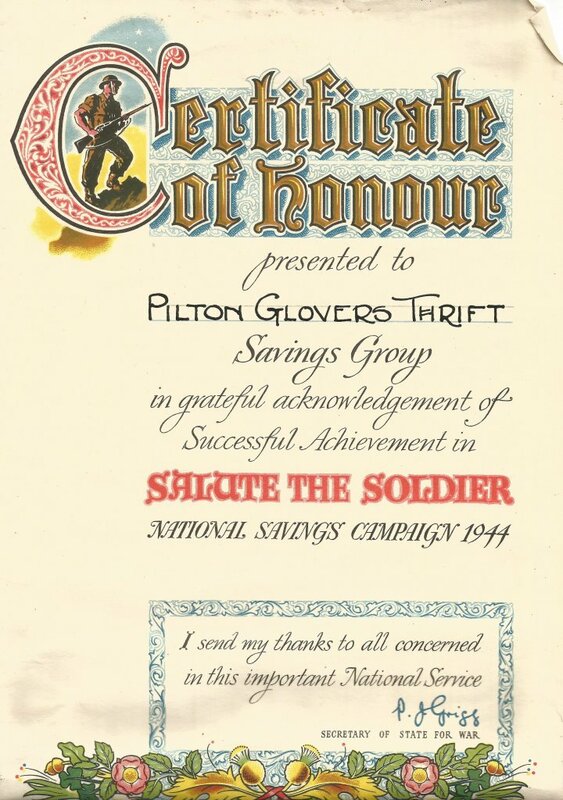 Some weeks or months after the campaign week, each community received a commemorative plaque and individuals and groups within the community were issued with an ornate Certificate of Honour, similar to the one for the 1944 Salute the Soldier Week shown here, which was awarded to the Pilton Glove Factory Thrifty Savings Group which involved Jane 'Jennie' Hobbs of Pilton who worked as a clerk, head of the export department and then as accountant in the factory until it closed in 1969. A similar Certificate of Honour was awarded in 1943 for the 'Wings for Victory' campaign. Thanks to Mary Passmore for passing us this certificate in Jennie Hobbs' papers after she died in January 2018.